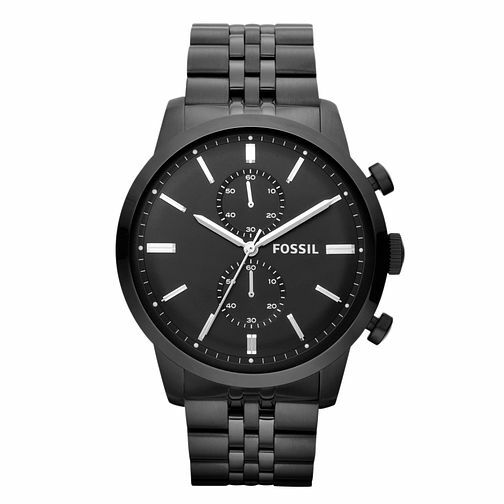 Inspired by architectural and automotive design of the 1960s, the Townsman black ion-plated bracelet watch by Fossil is styled with a black chronograph dial with contrasting silver tone baton markers. Perfect for adding polish to his look, day or night. Fossil Townsman men's black ion-plated bracelet watch is rated 5.0 out of 5 by 1. Rated 5 out of 5 by Anonymous from Brilliant! I purchased this product as a gift for my husband and he loved it! Although, I did pay for it to be gift wrapped and when it arrived the ribbon fell apart and the card didn't have the personalised message on it. Other than that, it was well packaged and delivered promptly. The overall product is very stylish and smart and easy to set up!